For the tribe, see Bazigar. Baazigar (English: Juggler) is a 1993 Indian crime thriller film directed by Abbas–Mustan starring Shah Rukh Khan and Kajol in the lead roles. It is a contemporary thriller about a young man who stops at nothing to get what he wants.The story is inspired from a 1991 British movie A Kiss Before Dying. This was Shah Rukh Khan's breakthrough role as the sole lead and Kajol's first commercial success. Actress Shilpa Shetty was supposed to debut with Gaata Rahe Mera Dil, but it remained unreleased, and this became her debut film. Baazigar was the first film in which Shah Rukh Khan played the role of an anti-hero and the first which earned Khan a Filmfare Award for Best Actor. Initially this movie was offered to Armaan Kohli and Salman Khan to play the lead role, but they all rejected it as the role had negative shades. Baazigar was a major commercial success upon release, and the first film of the famous Shahrukh Khan-Kajol pair. In addition to box office success, the film's soundtrack album composed by Anu Malik was also a success, selling 10 million units. The film brought actors Shah Rukh Khan, Kajol, and Shilpa Shetty, and composer Anu Malik, to the limelight. It was remade in Telugu as Vetagadu with Rajasekhar,, in Tamil as Samrat and in Kannada as Nagarahavu with Upendra. Ajay Sharma (Shah Rukh Khan) is a young boy who seeks revenge for his father's death which was a result of the actions of his trusted employee Madan Chopra (Dalip Tahil). Chopra has two daughters; the elder is Seema (Shilpa Shetty) and the younger is Priya (Kajol). Ajay finds a way to cozy up to Seema in a plan to take revenge upon her father. Chopra meets Vicky Malhotra (Ajay disguised with brown contact lenses), who charms both him and Priya. This way, he manages to date both Seema and Priya using different identities. Later, testing Seema over their love, Ajay and Seema write suicide notes when her father arranges her marriage with someone else. He then tells her he was simply testing her and rips his own note while keeping hers. He takes her to the registrar office under the pretense of marrying her, and pushes her off the roof, murdering her. Chopra hastily has the case closed to prevent further embarrassment in society once the suicide note is discovered. Priya suspects that her sister didn't commit suicide. With covert help of her college friend and police inspector Karan Saxena (Siddharth Ray), she investigates secretly. Ravi, a college friend of Seema, who likes her, finds a photo of Seema and Ajay together at a birthday party. When Ajay finds out about this, he murders Ravi and forces him to sign a suicide note which makes it seem as if Ravi is Seema's murderer. Thus the investigation is halted a second time. Ajay slowly wins Chopra's confidence. He has a flashback remembering his late father Mr. Sharma (Anant Mahadevan), who discovered that his project manager Madan Chopra was embezzling money, and had him thrown in jail. Seema's friend Anjali (Resham Tipnis) discovers a photo of Ajay from college days. Vicky and Priya get engaged. Anjali phones the Chopra residence during Ajay's engagement party to warn them that Ajay and Vicky look the same. Ajay intercepts and kills Anjali, throwing her body in the river. A man and his dog find the body soon after, and Priya and Inspector Karan realize that the murderer is still alive. History repeats itself with Chopra handing over the power of attorney to "Vicky". Ajay decides to hasten his plans on learning that Priya and Karan are hell-bent on finding the killer. His plan hits a glitch when he and Priya run into the real Vicky Malhotra (Adi Irani), Ajay's friend, whose identity he had taken. Priya becomes suspicious. After returning from his business trip, Chopra is shocked to find that the company is run by the Sharma group. Ajay reveals the truth of his desire to seek revenge and kicks Chopra out after humiliating him. Priya learns of Ajay's true identity from Vicky and rushes to Ajay's home in Panvel. She is shocked to see a marriage locket with photos of him with her sister. Ajay comes home, where she confronts him with his misdeeds. He tells her his story and Priya realizes that it is her father who is at fault. Ajay introduces her to his mother, who hardly remembers him. Madan comes and shoots Ajay in the arm and has his goons beat him up. When his mother tries to intervene, Madan injures her, angering Ajay. He is about to kill Madan but stops. Madan then stabs Ajay with a metal rod, laughs. Ajay laughs back maniacally and stabs him in return, killing him. He collapses in his mother's arms. In his last words, he says that he has regained everything and now only wants to rest. Priya and Karan watch despondently as Ajay dies in his mother's arms, finally at peace. The film's premise is a subversion of a concept loosely inspired by a Hollywood film, A Kiss Before Dying (1991), which itself was based on a novel of the same name. While it borrows the basic premise, Baazigar tells a different, subversive story. While Matt Dillon's character in A Kiss Before Dying is a villain who murders for money, Baazigar subverts this, with Shah Rukh Khan's character instead being a sympathetic anti-hero seeking vengeance for the brutal injustices done to his family. Several A-list Bollywood stars were approached for the lead role, but they turned it down, due to the character being a murderous, negative anti-hero. Salman Khan was the first choice, but he turned it down, with his father Salim Khan saying Salman was not ready for such a gamble. Anil Kapoor was the next choice, but he also rejected the offer, as it went against his "heroic" on-screen image. Shah Rukh Khan eventually convinced producer Ratan Jain that only he could pull off the role; Jain liked his confidence, and cast him in the role. However, his casting was criticized by trade pundits who incorrectly predicted that "a boy with cute dimples" would never be accepted as an anti-hero.Sridevi was supposed to play both female roles (twin sisters) as did Sean Young in original film, but the director realized that because of her popularity, the audience will not be able to sympathize with the hero if he kills the character played by Sridevi, hence they decided to cast different actresses. The music was composed by Anu Malik and won him the Filmfare Award for Best Music Director. The song "Yeh Kaali Kaali Aankhein" bagged singer Kumar Sanu his fourth consecutive Filmfare Award for Best Male Playback Singer after Aashiqui, Saajan and Deewana. Other singers featured in the album are Asha Bhosle, Pankaj Udhas, Alka Yagnik, Vinod Rathod and Sonali Vajpai. The soundtrack was released by Venus Music. Dr. Alban's song "It's My life" was also featured. A soundtrack was also released in Marathi. The film's soundtrack album sold 10 million units, making it the best-selling Bollywood soundtrack album of 1993. 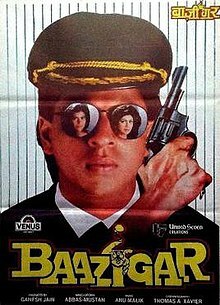 Baazigar was a commercial success and the third highest-grossing Indian film of 1993, below another Shah Rukh Khan film, Darr. Baazigar's collections in India were ₹7.75 crore nett and ₹14 crore gross, equivalent to ₹250 crore (US$35 million) adjusted for inflation. Best Male Playback Singer Kumar Sanu for "Yeh Kali Kali Aankhein"
Best Lyricist Dev Kholi for "Yeh Kali Kali Aankhein"
Best Male Playback Singer Kumar Sanu for "Baazigar, O Baazigar"
Best Female Playback Singer Alka Yagnik for "Baazigar, O Baazigar"
The later Hollywood films Almost Famous (2000) and Baywatch (2017) feature strikingly similar covers to Baazigar. Covers of Almost Famous and Baywatch feature Kate Hudson and Priyanka Chopra, respectively, wearing sunglasses that reflect other cast members, similar to the sunglasses Shah Rukh Khan wears on the Baazigar cover. ^ a b c "Box Office 1993". Boxofficeindia.com. Archived from the original on 14 August 2013. Retrieved 2 August 2012. ^ "A Kiss Before Dying". Retrieved 4 February 2019. ^ a b "Baazigar to Krrish 3: Diwali hits, misses and clashes from Bollywood". Firstpost. 22 October 2014. Retrieved 23 July 2016. ^ Taliculam, Sharmila (4 April 1997). "Rediff On The Net, Movies: An interview with Bollywood actress Shilpa Shetty". Rediff.com. Retrieved 23 July 2016. ^ "Fan trailer tonight: 5 times Shah Rukh Khan wowed us with his 'dark side'". Daily News & Analysis. 29 February 2016. Retrieved 23 July 2016. ^ "Shah Rukh Khan Filmfare Awards 1992 - 2009". YouTube. 30 May 2009. Retrieved 23 July 2016. ^ Ruhani, Faheem (22 August 2013). "25 unknown things about Salman Khan". India Today. Retrieved 22 September 2014. ^ BusinessofCinema News Network (16 July 2014). "10 Things You Didn't Know About Salman Khan". businessofcinema. Retrieved 15 December 2014. ^ Katiyar, Arun (30 April 1994). "What the stars don't foretell". India Today. Retrieved 23 July 2016. ^ "From 'Baazigar' to 'Dilwale' - A look at SRK and Kajol's on-screen magic". The Express Tribune. 13 June 2015. Retrieved 23 July 2016. ^ a b "Bollywood hinges on Hindi film music industry, fans soak up wacky new sounds". India Today. 31 October 1994. Retrieved 17 July 2013. ^ a b Iyer, Meena (14 July 2014). "Baazigar: The rise and fall of Shah Rukh, Kajol and Shilpa Shetty". The Times of India. Retrieved 23 July 2016. ^ "Roles Rejected by Sridevi". ^ "I dont want other music directors to catch up with me: Anu Malik". India Today. 15 November 1994. Retrieved 23 July 2016. ^ Press Trust of India (13 August 2012). "Melody will return to Bollywood songs: Kumar Sanu". Business Standard. Retrieved 23 July 2016. ^ Vijayakar, Rajiv (4 November 2015). "Anu Malik and Shah Rukh Khan: Sharing more than birthdays". Bollywoodhungama.com. Retrieved 23 July 2016. ^ "Darr - Movie (1993 inflation rate)". Box Office India. Retrieved 2 December 2018. ^ "Did Baywatch copy the poster featuring Priyanka Chopra from Shah Rukh Khan's Baazigar and Kate Hudson's Almost Famous?". Bollywood Hungama. 20 April 2017.